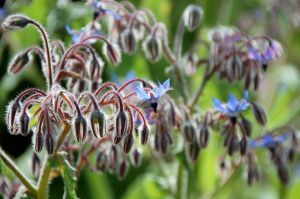 Borago Officinalis, et Sycopsis. These are rough plants, common in gardens, with great leaves and beautiful blue flowers. They are so well known, as to need little description. There is a third kind called Languae de beoeuf. The leaves are smaller than those of bugloss, but much rougher; the stalk rises about a foot and a half high, and is mostly of a red colour; the flowers stand in scaly rough heads, being composed of many small yellow flowers, not unlike those of the dandelions, and the seed flies away in down; the flowers are very bitter. The virtues of this plant are the same as those of Borage and Bugloss. They flower in June and July, and the seed is ripe shortly after. All three are great cordials, and strengtheners of nature. The leaves and roots are very useful in putrid fevers, to defend the heart, and to expel the venom of other creatures. The seed and leaves are good to increase milk in women's breasts, and to drive away melancholy; to clarify the blood, and mitigate heat in fevers. The juice made into a syrup has the same effect, and is a valuable remedy for the yellow jaundice, the itch, ringworm, etcetera. The flowers candied or made into a conserve, are useful for persons weakened by long sickness, and for those who are subject to swoonings. The distilled water is as effectual, and cures inflammation of the eyes. The roots of Bugloss made into an eleetuary, promote expectoration, and remove a cough. They are excellent for affections of the lungs. A good way of taking it is to infuse it in wine, which partly neutralizes its nauseousness.